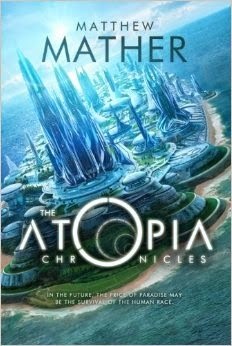 First up in my notable books post is one I recently read called The Atopia Chronicles by Matthew Mather. It's a sort-of science fiction book set in the not-too-distant future. Don't worry, no spoilers here. In this fictional future, the world's population has grown almost out of control and the wealthy and elite have escaped to a new floating city called Atopia. Atopia isn't affiliated with any government or country and has its own system of governance, defense system, etc. On Atopia, something called "synthetic reality" has been invented and is ready to be deployed to the world. Imagine microscopic computer chips in your brain that can alter what you are seeing, feeling, smelling, tasting, etc. With the push of a button, your tiny apartment becomes a lavish seaside resort simply by changing what signals are sent to your brain. Through a network of sensors, you can mentally travel anywhere and it feels like you're there because as far as your brain is concerned, you are. Your physical body stays behind and is controlled by artificial intelligence. Don't want to take the time to walk somewhere? Send your consciousness on ahead in an instant and leave your body to walk and catch up later. Want your hair to be a different color? Change it in the system without changing anything in the physical world. It's a truly fascinating idea and actually doesn't seem that far fetched. It makes for an excellent story that will both confuse and make you think. This is a book that you will remember for a long time because the ideas it presents are that thought provoking. Another unique aspect is simply the way the book is laid out and how the story is told. It is broken up into characters with each section of the book being told from that character's perspective. And each section tells the exact same sequences of events, so the first section starts at day 1 and moves through the story from the first character's perspective, then the next section starts back at day 1 telling the same sequences of events but through another character's perspective. It can be confusing at times, but it works surprisingly well here. A word of warning: in later chapters, the book gets slightly graphic by describing how a character was physically and sexually abused as a child. It sets up the story and is an important part of getting to know that character, but it is slightly disturbing as well. All in all, it's a great book that I recommend. The sequel, Dystopia Chronicles is also very good, though it doesn't have the same multi-perspective writing style as the first. It also gets very, very metaphysical toward the end, but it is just as thought provoking. You will almost feel out of breath when you finish it. The Atopia Chronicles can be found on Amazon (Kindle or paperback), and Barnes & Noble (paperback). Dystopia Chronicles can be found on Amazon (Kindle or paperback), and Barnes & Noble (paperback).